Japan’s sailor style school uniforms originate from the time when girls’ physical education was first introduced. The traditional Japanese clothing was inconvenient, so they went in the direction of Western clothing and finally came upon the sailor style uniform. 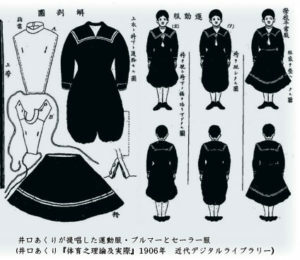 In addition, the open collar and the soft curves, which are a feature of the sailor uniform, were easily accepted since they adhered to the image of a “dutiful wife and devoted mother”, which was Japan’s educational philosophy of the time. 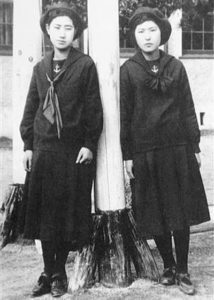 Around 1921 the Westernisation of Japan was ongoing, at the time schoolgirls were still one of the few elite, therefore the image of schoolgirl = sailor uniform was spreading. At that time, in Japan there was no large scale ready-to-wear clothes industry, therefore the sailor uniforms were supplied by tailors and upperclassmen made them for the underclassmen as a study of dressmaking. At this time, there were also areas where families made them for their daughters. Then Japan rushed into the Sino-Japanese War and due to circumstances such as supplies shortage and the control of fabrics, sailor uniforms entered a period of suffering. 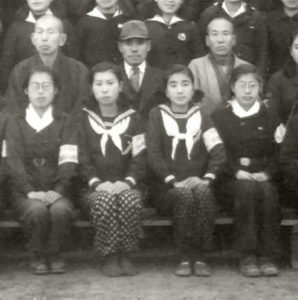 Generally the sailor uniform included only the upper part, they wore women’s working pants on the lower body, Monpe. Often it was hard to come by the line tape for the collar, so it was just a line, and also to save on the fabric, often there was no lining on the collar. It was difficult to repair the fabric, everyone tried to do their best with their own devices as they continued wearing the sailor uniform. 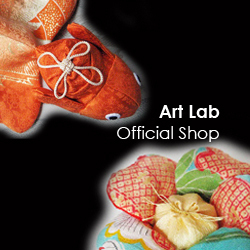 Is Japanese history of the hat young ?